Test the firmness and cutting strength of your meat, poultry or fish. Texture analysis is used to assist the investigation of meat quality predictors at the on-farm and processing stage of production. 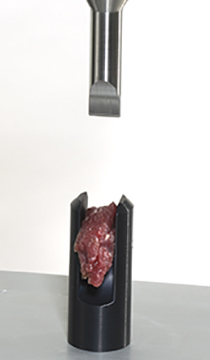 A novel measure of meat tenderness recently developed is the rapid slice shear force test. This method has advantages over the traditional Warner-Bratzler shear test for steak as it can be done immediately post-cooking. Toughness of cooked meat, firmness, cutting strength and rapid slice shear force are just a few of the test types you can perform when combining the TA1 texture analyzer with our food grips and fixtures for meat, poultry and fish. Learn more about our food grips for meat quality testing by reading the case story Measuring the Eating Quality of Meat.